Championship season is coming to a close. There's just one more ring up for grabs in stateside baseball before the book shuts on 2018. After six weeks of competition, Salt River (16-14) and Peoria (21-9) will square off in the Arizona Fall League Championship Game at 3:08 p.m. ET on Saturday at Scottsdale Stadium. The game will be broadcast on MLB Network. The Javelinas -- the only team to reach 20 wins -- cruised to a West Division title by nine games. Offense was the key to their success, as they led the circuit in home runs (27), runs scored (184), slugging (.414) and OPS (.784). It's no surprise that Peoria has been so tough to beat, as the squad features prospects from the Braves, Padres and Rays -- three of the best systems in baseball. Led by No. 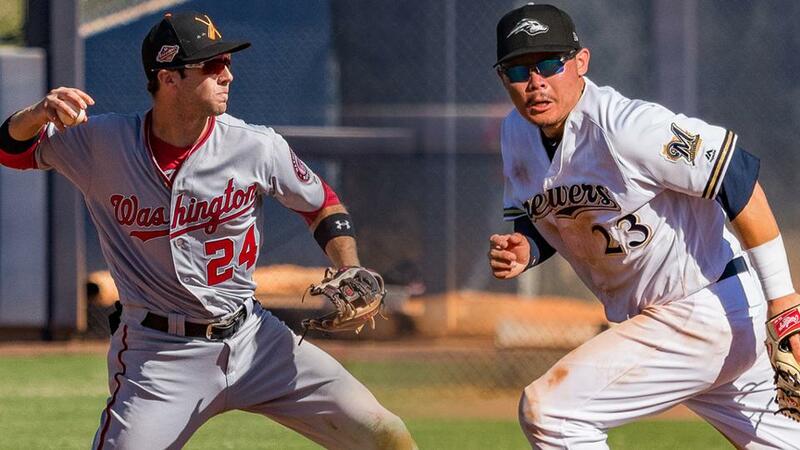 30 overall prospect Keston Hiura, the Javelinas also represent his Brewers, as well as the Mariners. For the East Division, the Rafters also bring the offense, leading the AFL in average (.277), hits (286) and stolen bases (55) with prospects from the D-backs, Nationals, Marlins, Rockies and Twins. Salt River is highlighted by a pair of Top 100 Prospects in Jon Duplantier (D-backs) and Carter Kieboom (Nationals). It should be an exciting matchup, so let's take a look at one interesting player from each organization who could see championship action on Saturday. Coming off a productive first full season in which he reached Double-A, Hiura has continued to shine in the Fall League. The top Brewers prospect led the circuit with 33 RBIs while his five homers were one behind the lead. Hiura's 70-grade hit tool was on full display, too; he batted .323 with a .934 OPS and 19 runs scored. As the highest-ranked prospect in the final matchup -- and with the numbers to back that status -- the 2017 first-rounder stands to be at the heart of the Javelinas' scoring opportunities. Davidson has had a pretty quiet career since being selected in the first round of the 2014 Draft, climbing to Class A Advanced over five seasons. But he's certainly made some noise this fall. The Atlanta prospect earned Player of the Week honors on Monday after tallying back-to-back two-homer performances, piling up six hits and seven RBIs over two games. Adding another long ball on Tuesday, Davidson tied for the AFL lead with six jacks. While his overall average (.227) doesn't jump off the page, it remains an encouraging sign compared to his regular season stats, especially given the top talent he's faced. A likely starting pitcher for Peoria, the 23-year-old Diaz got his second taste of the Majors this season with 11 appearances for San Diego. After splitting his time between the bullpen and the rotation all year, Diaz settled in as a starter for the Javelinas. The 6-foot hurler went 2-1 with a 4.87 ERA with 19 strikeouts and nine walks in 20 1/3 innings. But that ERA isn't quite indicative of his campaign. Diaz has a 1.93 mark in four of his starts, but in the other two, it jumps to 11.37. So fans will have to watch to see which pitcher shows up. Coming off his second straight season in which he hit below .270 with exactly 39 RBIs, Fox arrived in the Fall League ready to go. The Rays' No. 9 prospect collected six multi-hit games through his first seven contests and kept on hitting to finish with a .326 average and a team-leading 16 walks. (On this week's podcast, he credited improved plate discipline for his success.) As Peoria's leadoff hitter, the Bahamas native has set the table well, hitting .350 with a walk in the first inning while scoring 18 runs overall. He could get things started early en route to the title. After a dynamite first three months of the season in the Class A Advanced California League, Reed struggled in the Double-A Texas League in July and August. He got right back on track with a promising autumn. The Padres' No. 13 prospect hit .333/.397/.485 with seven extra-base hits and five stolen bases in six chances as he displayed his 70-grade speed. Reed's campaign was highlighted by the Fall Stars Game, when he ripped a game-tying triple with his team down to its final strike to earn MVP honors. The switch-hitter, who also had a strong All-Star Futures Game, could continue his propensity to hit under the spotlight in the nationally televised title game. Buddy Reeds gets a Gatorade shower from Braves' Cristian Pache after the Fall Stars Game (Freek Bouw/European Baseball Magazine). If the Javelinas get the lead early, they may turn the ball over to Mills. The Mariners' No. 9 prospect started his 2018 season as a dominant closer in the hitter-friendly Cal League, posting a 1.91 ERA in 42 1/3 frames, but he ran into trouble when he was promoted to Double-A. However, his AFL performance suggests that perhaps his Texas League numbers were an outlier. Mills posted a 1.93 ERA, allowing two earned runs over 9 1/3 innings. He also amassed seven strikeouts and three walks across his eight appearances. Building off a breakout season with Class A Advanced Lancaster, Colorado's No. 11 prospect finished the autumn campaign pacing all competitors with a .426/.535/.593 slash line. Nevin got hits in every game he played in except one, in which he came in as a defensive replacement in the ninth and did not bat. Like he did during the regular season, the 21-year-old slugger split his time between first and third base defensively, but his bat demanded a few games as the designated hitter when Salt River didn't play him in the field. Nevin figures to take advantage of the chance to put a bow on his brilliant fall. It was a tough start to the AFL for the second-ranked Washington prospect. Kieboom went 3-for-26 (.115) over his first eight games before finding his footing. Over the next five contests, the 2016 first-rounder tallied 13 hits to boost his average to .333. While strikeouts remain an issue for Kieboom -- though to a lesser extent than in the regular season -- he showed improved plate discipline by leading the circuit with 17 walks. If he gets in the lineup, this will be the 21-year-old's first taste of postseason baseball, but he's no stranger to playing as the center of attention. If Yamamoto gets the ball for the Rafters, fans are in for a real treat. Since coming over in the Christian Yelich trade, the Marlins' No. 17 prospect has done his best to make it a good deal for Miami. Working around a couple injuries, Yamamoto went 6-1 with a 1.83 ERA in 68 2/3 innings as he advanced to Double-A, then went to Arizona and did much of the same against tougher competition. The 6-foot Hawaiian went 3-0 with a 2.08 ERA, 27 strikeouts and 13 walks in 26 innings over six starts for the Rafters. Opposing batters hit .172 off Yamamoto. Fans' last glimpse of him before a potential championship appearance was five one-hit frames with one walk and six punchouts on Monday. Chisholm was not a regular for Salt River by any means -- he played 10 of their 30 games -- but he did make his presence known when he was on the field. The second Bahamas native to grace this list hit .442/.489/.767 with seven extra-base hits, nine RBIs and seven stolen bases. Chisholm's three homers tied him with Josh Fuentes (Rockies) for the Rafters lead, though he had 40 fewer at-bats. After climbing his way to the No. 3 spot among D-backs prospects over the past year, Chisholm's stock only continues to rise. And a late pinch-hit opportunity during the Championship Game could be the cherry. After ranking fifth in the Florida State League with 41 extra-base hits, Blankenhorn hit a little bit of a wall in the Fall League, notching a lone double. And while he finished the campaign with a .224 average, there is potential for a big title game. The left-handed hitter batted .036 in eight night games, but in nine day games, he hit .400. Twelve of his 13 hits came with the sun (presumably) out. And that's good news for Salt River fans, because the game will begin at 1 p.m. local time. Grab your eye black, Travis.